John said, ‘If you are repentant, produce the appropriate fruit’. Last Sunday we have begun of a new Christian year with its regular rehearsal of the story of Salvation in Jesus Christ. But a new liturgical year does not mean going back to square one just to repeat of what we did before; it means having the opportunity to gain fresh insights in our faith by tackling different sets of readings and, most importantly of all, a different gospel from last year. Since last week Saint Matthew has become our narrator, replacing the compassionate voice of Saint Luke’s Gospel. Matthew has become our guide, as it were, in our rehearsal of the life and ministry of Jesus – a guide with his own particular accent, agenda, and outlook. For example, one feature of Matthew’s Gospel that distinguishes quite radically its narrative from Luke’s is the attention the evangelist devotes to the new community of believers that forms around Jesus. It is in the pages of this gospel that we hear the disciples referred to as the Church; it is here that the Lord founds the Church on the ministry of Saint Peter, and it is here that we find the earliest gospel instructions about our life together. Crucially, Matthew sees all of us, the Church, as the New Israel, the new people of God, gathered out of all nations around the central person of the Lord Jesus, and called to be heralds of the Kingdom of Heaven through what we do. This path to become part of the new people of God begins in today’s reading with a remarkable invitation uttered by John the Baptist; a call to repent. Like all the prophets before him, John the Baptist is urging his hearers to repent of those bad choices and ways of life we call sins. Those who heed this call are invited to be part of a new, deep, and communal relationship with God, identified as the Kingdom of Heaven. In short the gospel is saying to us today, “Repent” because if we want to be disciples of Jesus, and if we want to be part of the Church, we must abandon our old ways of life and turn to God. Now, when preachers tackle the theme of repentance it can generally go in either of two ways; either they are going to warn their congregations with fire and brimstone sermons about the downsides, shall we say, of not repenting, or they are going employ a gentler approach, interpreting repentance as a spiritual exercise, a mental resolution to amend our ways. But I think our gospel reading is suggesting third way of looking at repentance as a life-long commitment, a conscious disposition that lays the ground for the good habits of love, justice, and religion to flourish in us. Yes, John is talking in no uncertain terms terms here, but he is only doing so to set the record straight about the kind of repentance we should strive for. Repentance is not for the proud-hearted; it is for those who in humility are able to acknowledge their faults and confess themselves a fallible creatures. Many of us still approach repentance while harbouring a sense of superiority towards others; the Pharisees in the reading did likewise and they were scolded by John! Repentance is not an arbitrary decision we take in the same way we make New Year resolutions; it is a true commitment to focus our attention each day on God, on others, and away from ourselves. 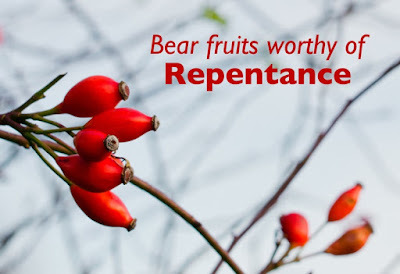 Repentance is not simply a spiritual exercise; it is a practical way of life filled with good works and religious devotion; the gospel shows this we it says, ‘If you are repentant, produce the appropriate fruit’. So, the call to repentance is laid before us from the word “Go”. As we take our first steps into the new Christian year repentance is presented to us as the very foundation of the Church’s life; the key requirement that sets the entire structure of our community – with one-another and with God – on solid footing. As we respond generously to this call the Lord will shape us more and more into the new Israel and into disciples of his love – a people sent to be herald of his coming to a waiting world.